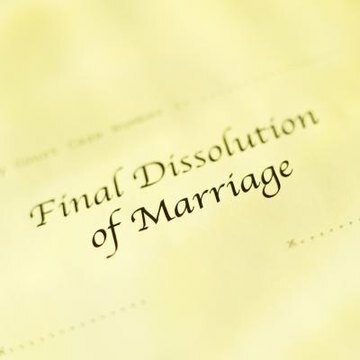 The legal term for divorce in Florida is "dissolution of marriage." To dissolve your marriage, your relationship must be irretrievably broken. Finding appropriate counsel can also be helpful in your Florida divorce process. A divorce lawyer can help you to correctly complete the steps of the divorce process, from filing your petition to having a judge approve the action. File the divorce petition. Either spouse or his/her attorney can file this petition, which states the intention to divorce and lists desires regarding child support, custody, alimony and/or division of property and debts. Divorce in Florida is no fault. This means that spouses do not have to prove wrongdoing. The only requirement for divorce is that at least one party is a Florida resident and that the marriage is "irretrievably broken." One party must reside in Florida for the six months immediately prior to the divorce petition. Serve the other partner with the divorce papers. A process server will usually do this. This partner or his/her attorney must file an answer to the divorce petition within 20 days, addressing the filing partner's wishes and any other matters. Provide financial documentation and a completed financial affidavit to the other party within 45 days of service of the divorce petition. File a child support guidelines worksheet. This must be filed before any hearing on child support. Write up the divorce agreement and present it to a judge. If spouses agree on the conditions of the divorce either before or shortly after the petition is filed, the divorce agreement is written up and presented to a judge to be finalized. This is called an uncontested divorce. Work with a mediator if you are unable to agree on divorce conditions (a contested divorce). Escalate the matter to the courts, if necessary. If mediation does not work, the matter is sent to the courts. The judge will make a final decision on the contested issues. Emily Vertosick is a writer, editor and proofreader, specializing in the fields of science and technology, health and medicine, crafting, travel and culture, computers and frugal living. She holds a master's degree in public health from SUNY Albany and a bachelor's degree in French studies from Bard College. Vertosick, Emily. "How to Get Divorced in Florida." , https://legalbeagle.com/8143579-divorced-florida.html. Accessed 24 April 2019.